My little bears see me sewing all the time and they always want to have a go. They love to take turns crawling under the table and pressing the foot. On a gloomy day not too long ago, Isla came to me and asked to sew a doll herself. Oh man was I excited! The day had finally arrived where I could share something I love to do with my little bear without boring her. 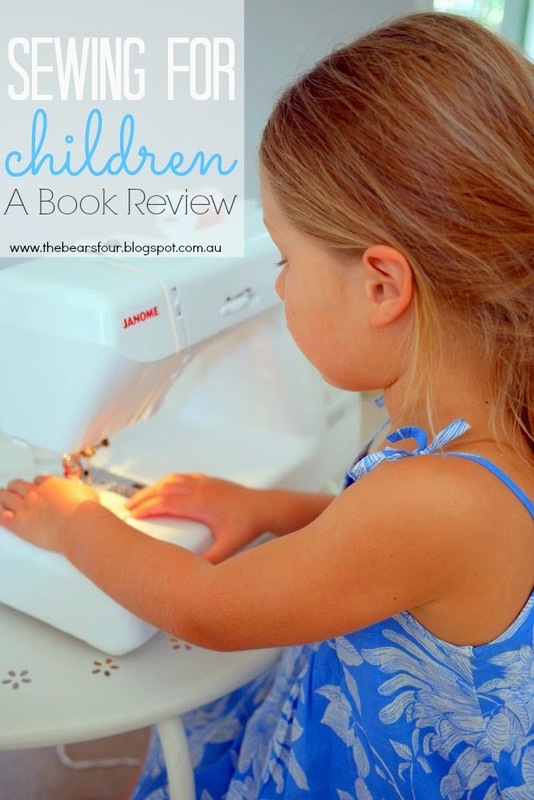 I think five is a great age to start to teach the basics of sewing, kids are better at staying focused, eye-hand coordination is there and they can listen to directions well. My mother in law gave me the book, Sewing for Children by Emma Hardy, which was a prefect starting point for Isla's, hopefully, life long interest. Read on for more pictures and review. 1. It can be finished in one or two sittings otherwise it's difficult for kids to see the light at the end of the tunnel. 2. The pattern can easily be traced and cut out by little hands. 3. It's a project that actually interests them. They HAVE to be interested in what they're making, otherwise they're likely to give up and have an unfinished project. 4. If possible keep the hand sewing to a minimum. 5. Pick projects that have mostly straight lines, so they get the hang of basic sewing before throwing too many curves in there. The patterns and directions in the book are really easy to following and there are step by step photos to guide you through the project. A lot of the projects also coordinate well together, like cloth tea set, doll clothes, bedding, etc. There are also plenty of projects that both boys and girls would be interested in. Charlie is keen to make the pirate hat and eye patch! After Isla spent a good deal of time perusing the book, she settled on making the doll on the cover. Now I knew that it was probably a big project to tackle on her first time out the gate, but we gave it a go and she sewed 90% of the doll on her own. The project did take a good three hours from start to finish, but with snack and story book breaks in between. After the doll was finished Isla decided it was imperative that a tea party take place in celebration. Thanks Peg! She'd love to sew something with you! Yes it really is a joy to start sharing your passions with your kids. An adjustable speed sewing machine makes ALL the difference when teaching kids! Sooo cute! Isla Poppy did a wonderful job! What a great gift from Gill.